Chrome multi bicycle wheel hanging lamp. 1955 RCA Victor Model 21-D-527U Deluxe. Updated with newer TV. Tube type for best realistic look, remote controled & color, hook it up to DVR, Satillite, Cable, or Digital Converter. 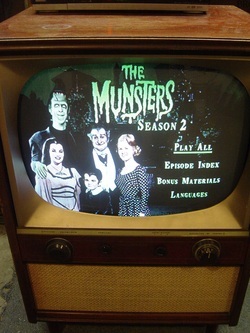 Can be seen or just watch the Munsters with us at Holy Cow Market and Music Sundays 11am till 4pm. Sold! 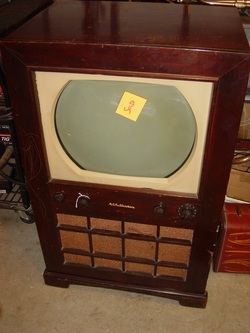 The TV cabinet is a 1950 Zenith 23A table top model w/era correct tv stand. The old non working tube and guts have been removed and replaced with a modern color tv. Ready to be hooked up to cable, dish, DVD or digital receiver. The housing is a 1955 RCA consol TV the original tube and electronics were removed it had a shelf installed and it was being used as a display case. I removed the added shelf and replaced it with a remote controlled Sylvania color TV. Ready to be hooked up to cable, dish, DVD or digital receiver. Vintage Portable Suitcase DJ System! 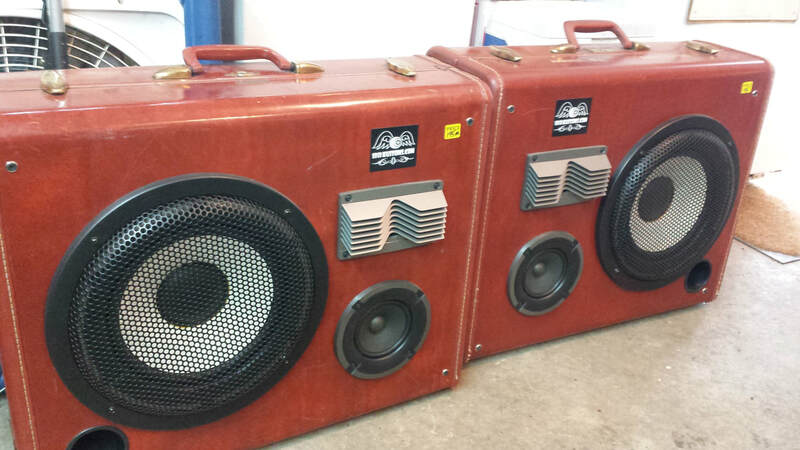 Vintage brown Samsonite suitcases converted into a retro portable DJ system. 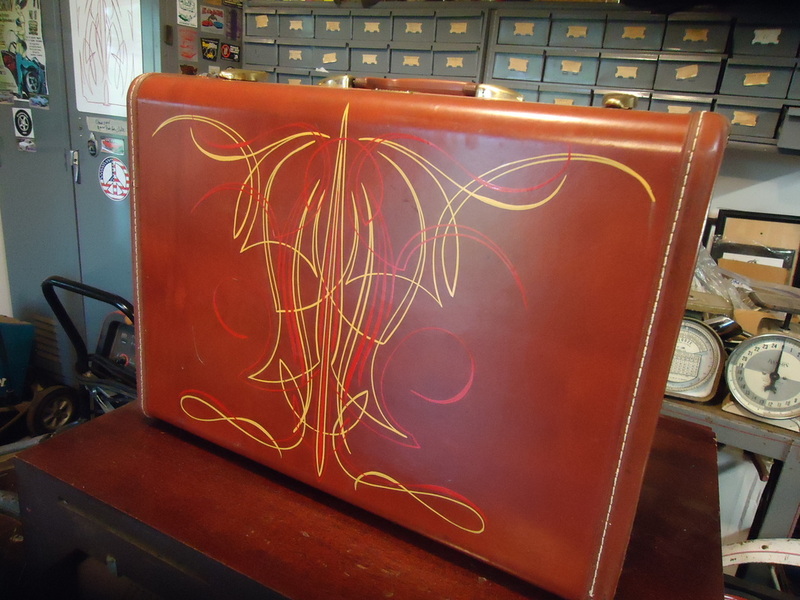 The center case has been pinstriped by Von Mex, and contains a vintage Sony TA-AX2 Intagrated Amp w/ an Audio Technica Turntable. Aux inputs available for adding an Ipod or tape etc. Speakers are sold, but have other pairs available, see below. Amp/turntable case only $250 obo. Vintage Samsonite Suit Case Speakers. ﻿Vintage Burstein Applebee Model 400 Speakers * 3-Way Speakers with 12" Woofers * Variable tone adjustment knobs on the rear panel * I believe these were produced during the 1960's * These Speakers are all original and have amazing sound quality﻿! The cabinets are in pretty good "overall" condition for their age * there are a few scratches, a couple of water ring stains and a few blue paint drips. The grill cloth is good, no rips or tears. VINTAGE ELECTRO-VOICE ENTERTAINER PORTABLE SPEAKER SYSTEM. THESE COME WITH RARE HARD TO FIND SPECIAL HANDLE THAT MAKE CARRYING EASY. STILL WORK NICE AND SOUND GREAT. 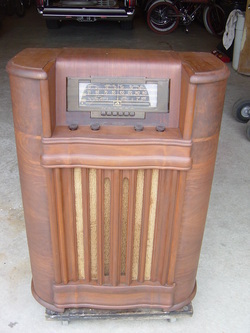 All original and working RCA Consol tube amp Radio. Cleaned and refurbished finish. Great sound, it even has a RCA jack on the back so you can plug in your IPOD and play your music through it. 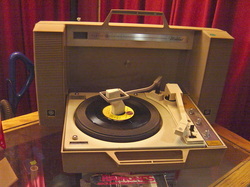 This is an all original GE Wildcat portable record player. All functions work good and has a new needle. 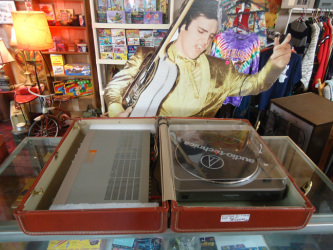 It plays 33, 45, 78rpm records, and comes w/the 45 adapter. Like the one in Chrismas Story but custom made right here in the US by 10~18 Kustoms and not made in China like the ones you can order online. 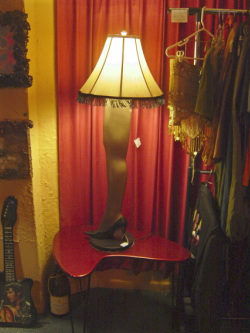 About 48" tall, w/3 way lamp fixture.